The name is said to derive from O.E. Aegeles ham; Aegel’s homestead. 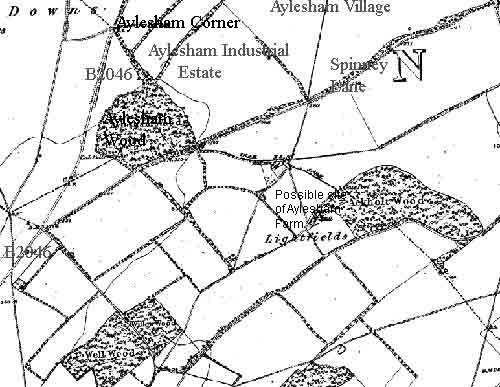 Aylesham now refers to the actual mining village, but before the village was built there were references to Aylesham corner, wood and farm. Aylesham was part of the manor of Ackholt, but nothing is really known of its origins. The earliest presently known reference to Aylesham is in a 1367 grant from “Thomas Peny of Welle (possibly connected to the present Well Wood in Womenswold parish, a half mile or so across the fields to the south) to Salomon Oxene (of Oxenden, a half a mile to the east) of 20s being the rent of a wood ect. at Elisham juxte Crudeswode (next to Curleswood Park, which is now almost covered by the present village of Aylesham, its boundary with Elisham probably followed the present Spinney Lane) in Welle”. 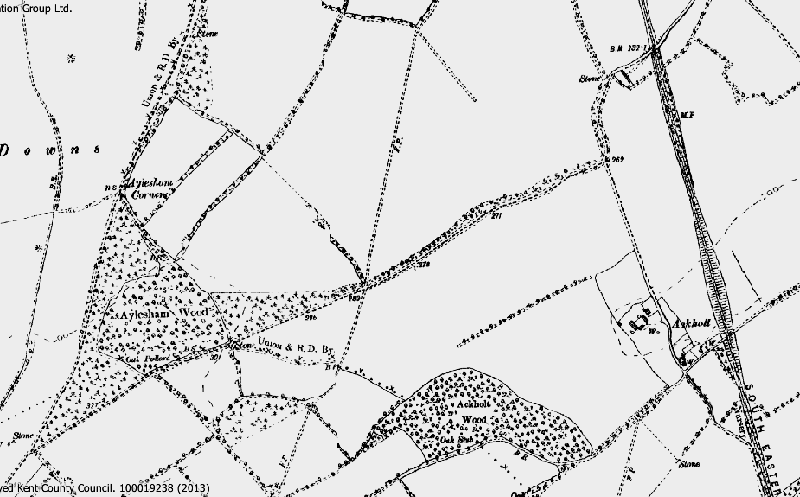 This was the wood recorded as Aylesham Wood on 19th century maps. Aylesham Wood in the 1870′s. 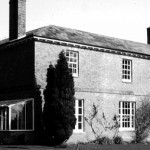 It directly bordered onto Curleswood Park, now largely covered by Aylesham village and industrial estate. The open ground between the wood and the junction of Spinney Lane and the B2046 was once poor quality agricultural land called Poor Start and Little Profit. It’s now over grown and has become part of the original Aylesham Wood. A few years later in 1418 a grant was made by Henry Danyel of Sellynge (Selling, near Faversham), to John Fyneux, Thomas Marchaunt and John Tooks of “lands in Aylsham including Croddyswood (Curleswood)”, and in 1445 a release was made by John Monyn and John Holte to Richard Sandys , Esq., and John Greneford “of the Manor of Acholt, with lands ect., at Haylesham Nonyngton, and Wemynlyngs Welde (Womenswold) near Wingham”.This woodland environment appears to be confirmed in 1405 when a grant from “Matilda, widow of John Twytham, to Henry Danyel, of five pods of wood in a wood called Eylsham abutting on the park called Cuddeswode (Curleswood)”. A pod was probably equivalent to a cant, which is a block of woodland coppiced (harvested) on a regular basis. Woodland was economically very important in medieval Kent as it provided everything from building materials to fuel for cooking and industry. Some 160 years later in 1604 “John Swanton of Aylesham [in Nonington], yeoman”, was elected as the Nonington parish constable, an important position in the community as he would have been responsible for upholding the law and apprehending lawbreakers within the parish and was answerable to the local magistrates. His description of “yeoman” and his election as constable indicates he was a well-to-do farmer, either owning at least some of his own land, or renting a fairly substantial farm. Parish constables were eventually replaced by the fore runner of the modern police in the early 1800’s. The farm or small-holding may have been located at the southern end of the present Ackholt Wood. The 1839 Nonington parish tithe map has an Ackholt Wood House and some three and a half acres of land at the southern end of Ackholt Wood listed as belonging to Sir Brook William Bridges and occupied by William Gilham, but there is no record of the house or land on the 1859 parish tithe map. The location is now overgrown, but still discernible as the trees there are not as high or as mature as the rest of the wood. 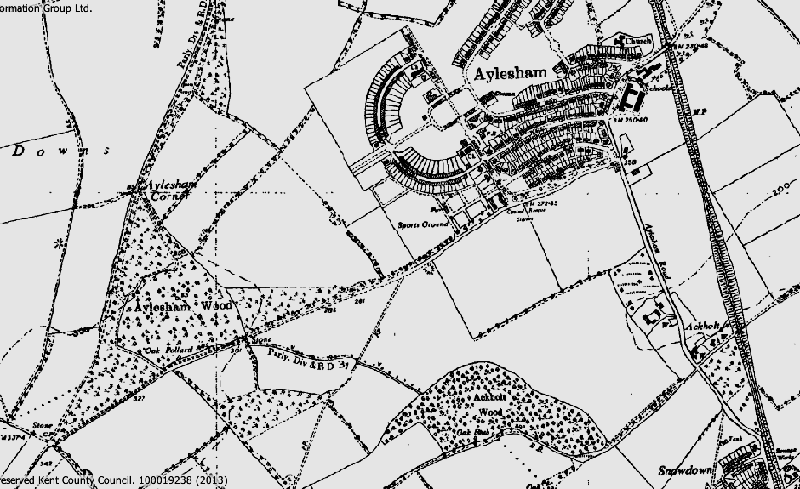 Aylesham was established as a village in 1926 and designed and built by Dorman and Long to house the workers at the nearby Snowdown Colliery which the company owned. Colliery workers came from all parts of the UK seeking better wages and safer conditions, notably from South Wales, Scotland and the North-East.